HYPNOTIC , ABRASIVE, EXFOLIATIVE and TRIUMPHANT, A delicate but womanized survival victory, a tale with no compassion and happy ending. Enjoy an unique musical work of what could be called: a hypnotic, abrasive, exfoliative, and triumphant Techno journey. Track Listing//////// 1. She Left Herself (07'03) - Original mix 2. She Left Herself (06'27) - Pito mix 3. 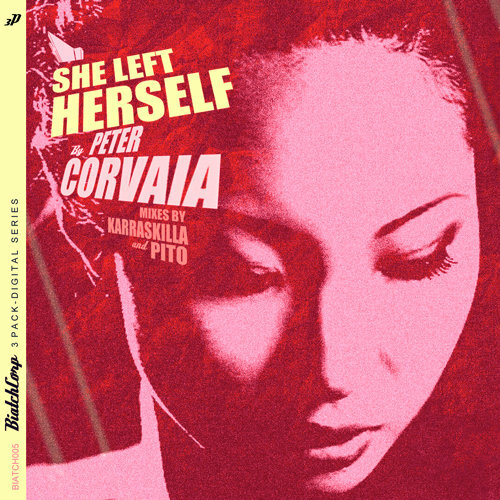 She Left Herself (08'54) - Karraskilla 's Amazonas mix W+P by Peter Corvaia Additional production and remixes by Alvaro Bueno and Juan Karraskilla. Mix and mastering by Rob Rives. Biatch Corp Recordings is pleased to welcome a special new member to the label family, DJ/Producer Peter Corvaia. Peter is the master and commander of the label's newest installment. His upcoming EP, "She Left Herself," is the first 3-pack digital series to be released by the corporation, and it is also our last release of 2009, rounding off a total of five releases in our first year of existence as a label.